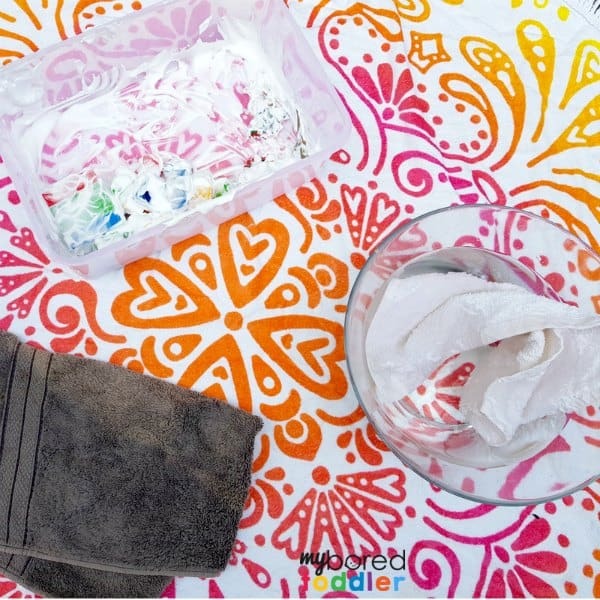 Welcome to the first day of our 5 day Toddler Messy Play Challenge! 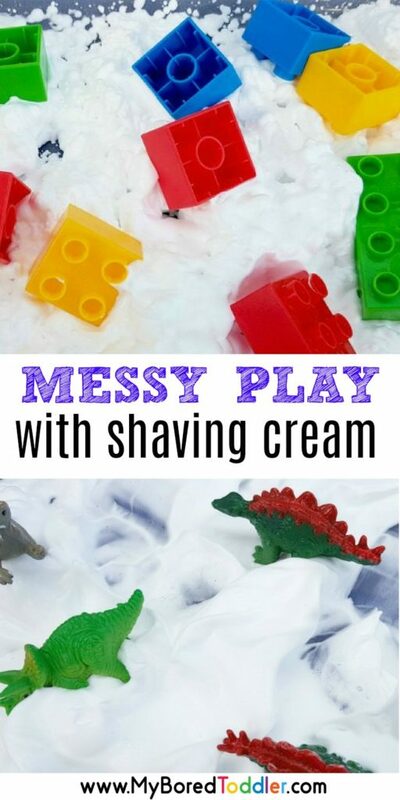 We’re starting off with messy play with shaving cream or whipped cream today – a nice easy messy play activity to get your started. If you haven’t yet signed up to our Messy Play Challenge you can do that HERE (it’s FREE!). 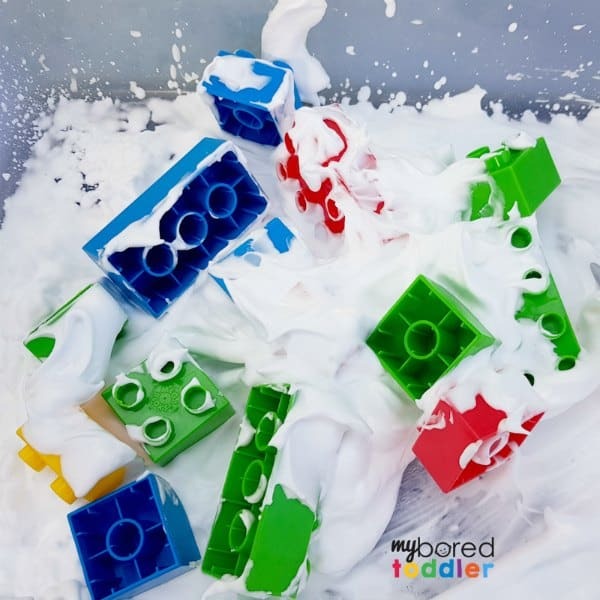 I’m so excited to kick off this challenge as I know that messy play is one of those activities that a lot or parents are reluctant to try at home. I’ve kept today’s activity as simple as I can as I don’t want to scare anyone off! 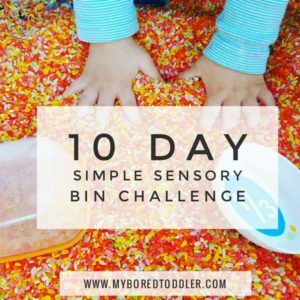 As I’ve already mentioned, the aim of this challenge isn’t to come up with complicated activities – just simple, easy to set up activities that you can do easily at home. Shaving Cream or Whipped Cream (if you’re not confident that you’re child won’t put it in their mouth, go for the whipped cream option). 1 can will do. Any blocks or toys that you have at home – I used Megabloks and Safari Ltd Dinosaurs but please just use toys you already have! Food coloring – optional. If you do get some, try to get a pack of mixed colors like these ones. I didn’t add food coloring to today’s challenge as I thought it might be a it “too messy” for some of you who are just starting out, but feel free to add a few drops if you like. This activity is really easy to set up. 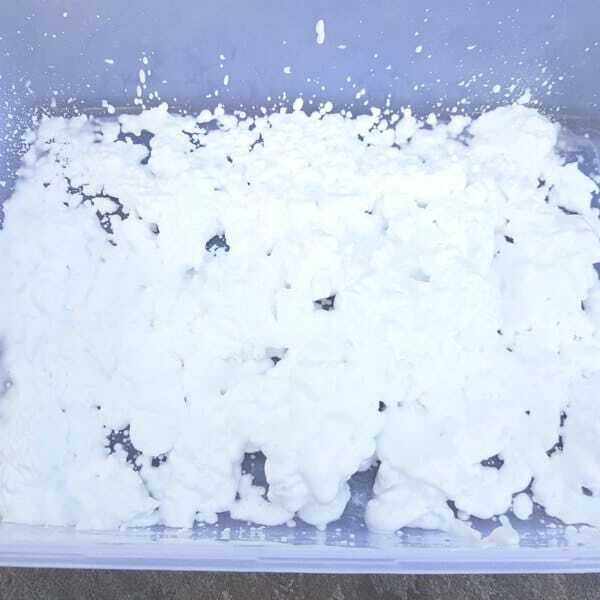 All you need to do is fill up your container with shaving cream. Let your child have a play with the shaving cream on it’s own to start with and let them get used to the feel and the texture of it. Once they’ve had a little play add some toys. We started by adding blocks. This was lots of fun – we sorted the blocks, we hid the blocks and we did some building with them. 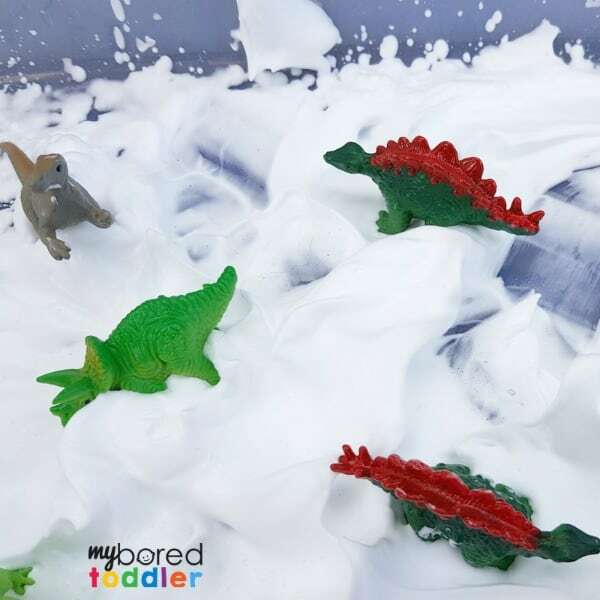 Add your next toys – we went with our dinosaurs (these ones are great and you can get them HERE). The shaving cream became snow and then a volcano, and there was a lot of language and pretend play going on. Washing the dinosaurs was a lot of fun too! We then washed all of the toys in our bowl and dried them – this part of the activity was a hit too! Simply set up a bowl of water, a cloth or facewasher and a hand towel so that they can dry them too. Stay tuned for tomorrows challenge! 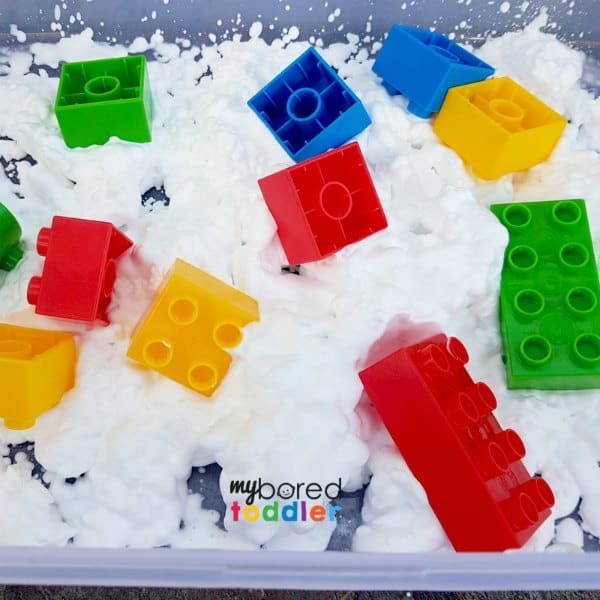 « What you need to take part in a messy play challenge!